My main research is in the field of eclipsing binary stars. More than half of all stars are found to be members of orbiting pairs, called binary systems. The lone, single star like our Sun appears to be the exception rather than the rule. For many of these binaries we happen to lie near the plane of their orbit so that one star periodically covers the other, half an orbit later the other covers the one. All of these eclipsing binaries are so far away that we do not see the individual stars. Their nature is known by the periodic dimming of the brightness of the light of both that is combined into one dot on the sky. The illustration below, taken from the textbook used in our Introductory Astronomy course, shows how the brightness varies as each eclipse occurs. We observe these eclipses using sensitive light measuring equipment called photometers, or digital cameras called CCD's. We measure the brightness of the star every minute or so throughout an eclipse (which usually lasts a few to several hours). A plot of actual measurements for one of these eclipses is shown below, as obtained at our Dark Sky Observatory. Each dot represents the intensity of the starlight, plotted at its time during the night. 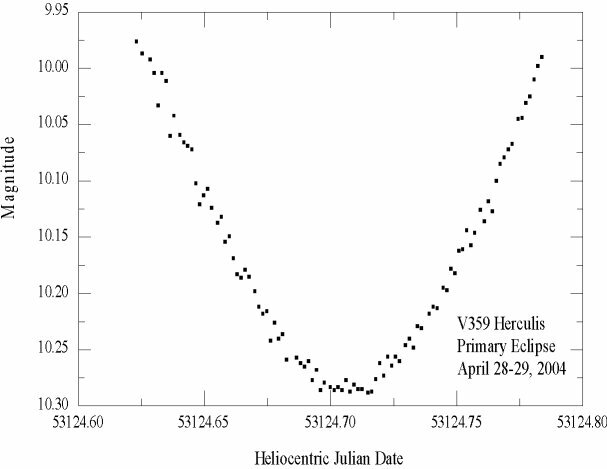 The time is represented as Julian Date--the horizontal axis is in days with local midnight occurring about 0.71, and is corrected to the time if observed from the position of our Sun (to synchronize the time to an international standard). These eclipses are studied to compare their actual time of minimum light (when both stars are lined up with us) to the predicted time. Differences between the observed and predicted time can be due to changes in the orbital period of the system (the time from one eclipse to the next). These changes can be caused by exchange of gaseous matter between the two stars or even by loss of matter from the system. Starspots, enormous versions of sunspots, can also cause changes as they eject matter in a jet-like manner from one star. Some systems we are observing have a more subtle cause of period change: variations due to the effects of General Relativity. Stars orbiting close to each other experience effects of GR due to the intense gravitational field. We monitor about fifty such systems, several of which show changes in apparent disagreement with the predictions of Einstein's GR. By observing these eclipses over several years, to decades, we can hopefully come to an understanding of these unexplained changes in orbital motion.